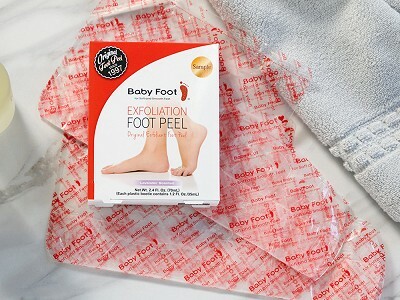 Baby Foot exfoliating masks are a bit of a cult favorite, and for good reason. The treatment removes dry and dead skin from feet layer by layer with very little effort from you. All you need to do is pull on the booties and kick back for an hour. Rinse off and go about your life—but fair warning: in a few days, that dead skin will start to peel off, bit by bit. It’s a little weird and a lot satisfying. The gel in the booties is packed with natural fruit acids and extracts that target dry skin and break down the desmosomes that hold the layers together. The process will be complete within two weeks and you’ll be left with soft and smooth skin. Go for a moisturizing mask to keep feet in that great-looking condition. We tried the mask and were impressed with the results. It’s the perfect pre-sandal season step, or a treat for dry feet any time they need a little TLC. Does Baby Foot® contain two plastic booties for use? Yes, one Baby Foot pack contains a bootie for each foot. No, the booties are not reusable. Bathe as usual and do not add lotion if possible. If your feet become too dry, you can apply an oil-free moisturizer. The peeling process will be enhanced if you can soak your feet daily. Do I wash my feet after soaking? Yes, remove the plastic booties after using the one-hour treatment, then rinse your feet thoroughly. Don't add lotion to your feet until the peeling process is complete. If your feet are too dry, you can use an oil-free lotion from time to time. No, you can walk around if desired. How long does it take for skin to peel off? 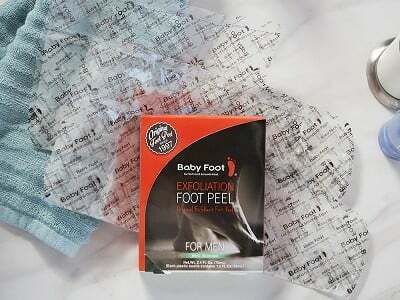 How often should I use Baby Foot? Results will vary, but peeling usually begins within three to seven days. Soaking your feet daily will speed up this process. The peeling process is usually complete within seven to 10 days. Baby Foot can be used whenever you notice the build up of dead skin cells. They recommend using it every two months.